Hello again, everyone. Forgive my inability to understand Dutch. Here is a walk-around of my "almost" completed project. And, here is my good friend "Mac" (a Canadian Mountie) turning the key for me. wow is the only way to describe this. I assume you have put a lot of effort, money, blood, sweat and tears into this. Big 2 thumbs up for your beautiful website too. "Een 427/435 BHP Tri-power rijden duur? Mwha, tank altijd voor een snip!" Looks like a nicely detailled project! I find it just amaizing you removed the old paind with soda blasting!? Thay baby is going to roll like she has done in her early day's.. or better! From time to time (Canadian time that is ) Jake is around here. Nice to see you're so interested in your Dutch Corvette community. You may have noticed that I only posted the start-up video on two Corvette forums. My good friend Jake Ruiter introduced me to this one. The car looks great,and with that 502 cubic inches under the hood should be a real screamer. We will have to get some pictures of Your and my car together and post it here after You are totally done. A friend took this photo. I think it's the best I have so far, until I can get the car to a scenic area and spend some time getting good shots. I like it ... No, I love it! 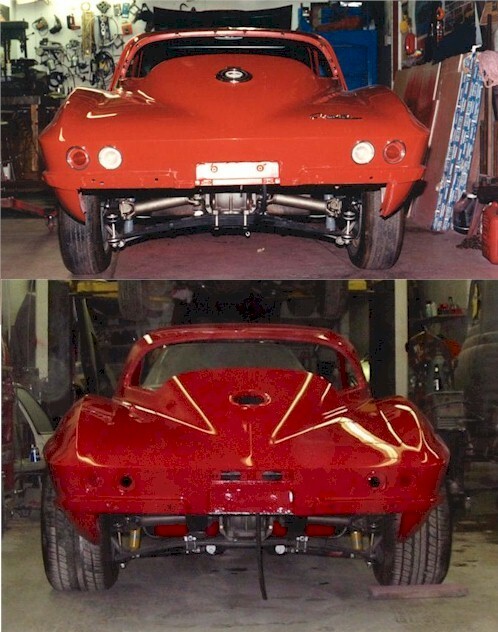 "Af en toe een beetje gekkigheid in je leven"
Corvette: Yellow 78 with GhostFlames/ stroker engine !! 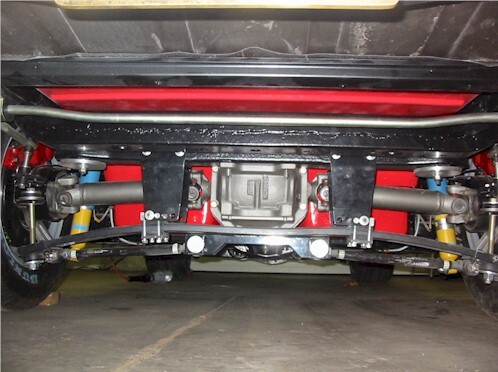 Here's a look at the underside with the updated Vette Brakes suspension. The first car is a friend's 1965 with stock suspension and wheels. The second car is 67HEAVEN with the new wider body panels and P295-50R15 tires on 10" wide wheels. [Wow!] She really is a beauty[:P] ! [Yeah!] 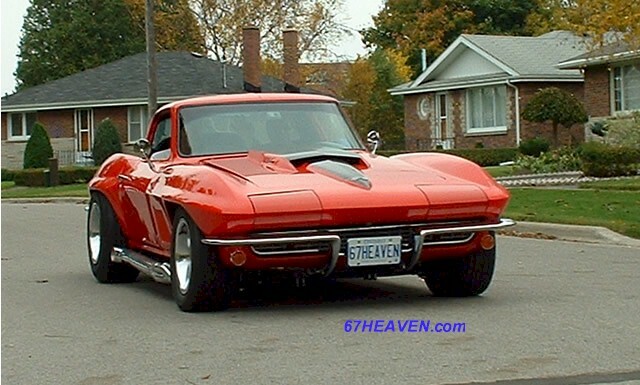 A big block C2 is my favourite Vette! Take good care for her and lots of joy to you both ! What a great project and what a beautiful car. I'm in love with it. 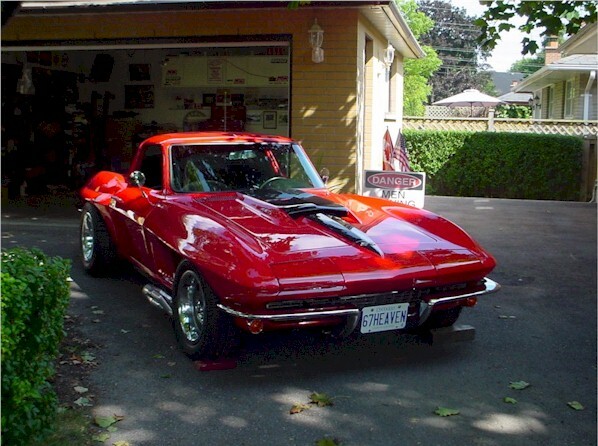 Big block C2 Corvettes are my favorite too. You seem to be creating a large following even in Holland with Your car. And I have to admit it turned out beautiful after many hours well spend on a worthwhile project, congratulations. And it sounds awesome I can attest to that ,having heard that engine roar in person. On Sunday, we took our first street ride after the 4.5 year rebuild. My friend's '65 Fuelie offers a good comparison of the body. Can you see the wide body change that allows me to run 10" wide wheels on the rear and 8" wide wheels on the front? The pic`s are nice, but the question is ..... HOW WAS IT?????????? Corvette ... I like those big toys makin' big noise ! A basic feel for the car was what I was looking for. A few issues have been identified (nothing serious), and I'm looking forward to longer and longer runs. We kept it within the neighbourhood this time and had fun waving to everyone during our cruise-bys. Probably only put on about 2 to 3 miles all together, but it sure was fun. All in all, considering the massive amount of new parts and extreme changes designed into the car, it felt surprisingly tight and nimble. Next stop is the paint shop, in about a week, to make some relatively minor adjustments......such as the colour of several items painted separately. The headlight buckets, wiper grills, lower rear valance, etc. are all a little darker than the car itself.....but not for much longer. Does it feel like it has some muscle? Holy cow.......that would be an understatement!!! Slight pressure on the loud pedal in any gear makes the rear end very nervous. ZZ-502, 8.2 litres, Richmond 5-speed, complete Vette Brakes suspension front and rear. Does it handle well with the VB&P Performance Plus Suspension? So far, I'm very impressed, but like I said earlier, we kept it within the neighbourhood today. Stay tuned -- more to follow in the weeks to come. O yeah baby, let the tale begin!!!! Got some more drive time in the last few days.